Last night (the magnificent) Jedward were voted off of the X Factor TV show. I have previously written about how the impact of the X Factor show has produced an echo and reached out far wider than the TV set - with enormous discussion being prompted on social sites like Twitter and Facebook. 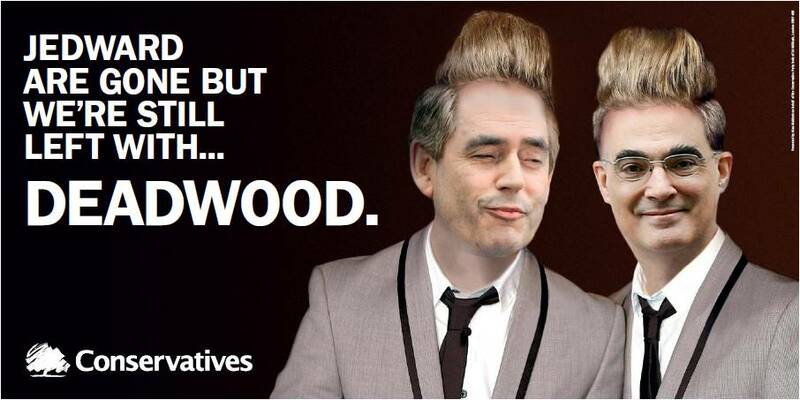 Another indication of the X Factor / Jedward impact can be seen with the latest UK political campaigning - both Labour and Conservative parties have produced political posters parodying the twins. 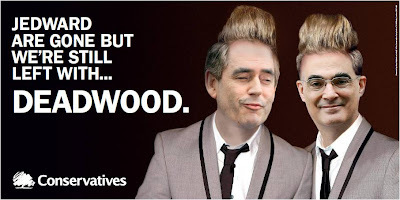 So who benefits most - the Conservatives through having a neutral Jedward message, Labour for being the first to go down the Jedward route or the Liberal Democrats for not getting involved? If this is the way things are going to go then maybe we should forget a general election and just let Dannii Minogue choose the next UK government? Malcolm Middleton and Lucky Soul - Web 2.0 vs X Factor for Christmas Number One?